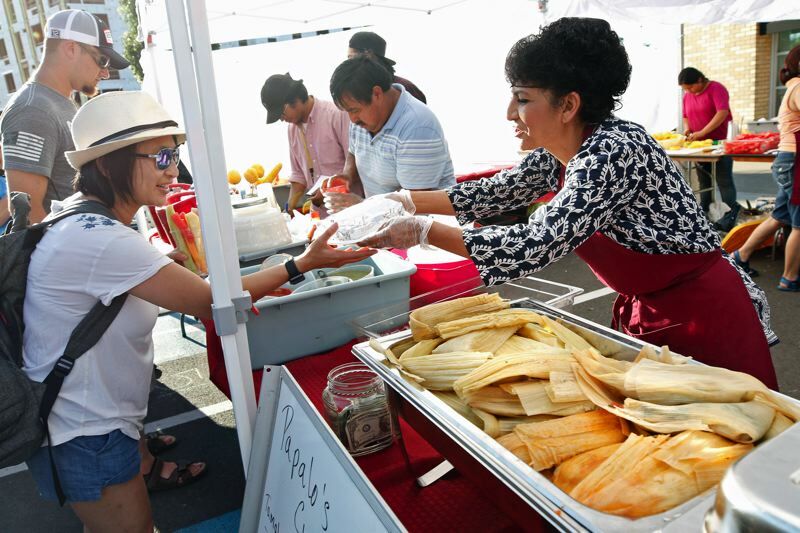 Big crowds embrace multiculturalism for first of two Night Markets in Beaverton. Beaverton's first Night Market of the drew drew a colorful array diverse people, food, art and music on Saturday, July 21. 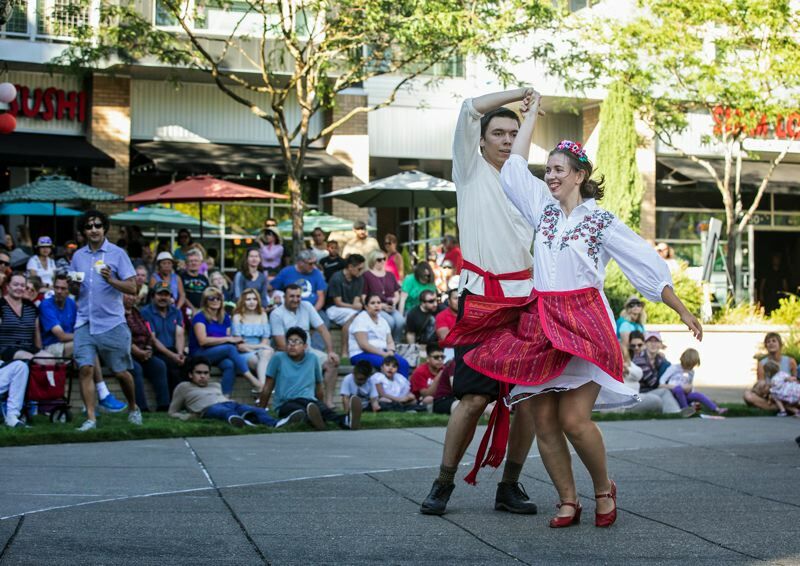 Sponsored by Beaverton's Diversity Advisory Board and with a goal of keeping the setting family-friendly, the market hosted cultural vendors, ethnic food booths, a kids crafts station and a line-up of diverse performances. Kids were hula hooping and knocking over towers of jumbo Jenga blocks while 7-year-old Lucy Biado-Luis wore a sequined cat-ear headband and had a purple Indian bridal pattern painted on her forehead. Lucy's mom, Leah Biado-Luis, asked what she was looking forward to the most, but Lucy gave a shy grin and a big shoulder shrug. "Lucy has actually never had a churro before so that's definitely on the agenda," Biado-Luis said. A mini churro cart nearby attracted a large line as Isabel Sanchez, owner of Churros Locos, rolled handmade churros and plopped them on top of ice cream sundaes. "It started at the Oregon Coast," she said. Five years ago, while her and her husband walked along Seaside eating gelato, they said they thought to themselves, "Why aren't there churro stands here?" So they decided to make their own. Since they began the business, they've been invited to the World Street Food Congress in Singapore and Manila, Philippines. Another booth across the market sold handwoven scarves, dresses and blouses that were dyed using vegetables. Rukmini Reddy, the vendor, said the traditional fabric comes from Pochampally, an Indian town. "I live very close to this place," Reddy said. "We've been using this fabric since my childhood." For her first year at the market, Reddy said she hopes she can share the traditional values woven into the fabrics. "There's no power there," Reddy said. "We have to learn to be sustainable," she said. "It's an art of life." First time visitors Kevin Borquist and Michelle Rumohr said they decided to stop by after reading about the night market online. They said they enjoyed a fresh shawarma and the music the most. But their real fun, Borquist said, was having "at least a dozen people" approach them asking to pet their dogs, Bramble and Maribel. Bramble, a rescue, was shaved to look like a miniature lion. "It's his summer cut," Rumohr said. "I think he likes the attention." 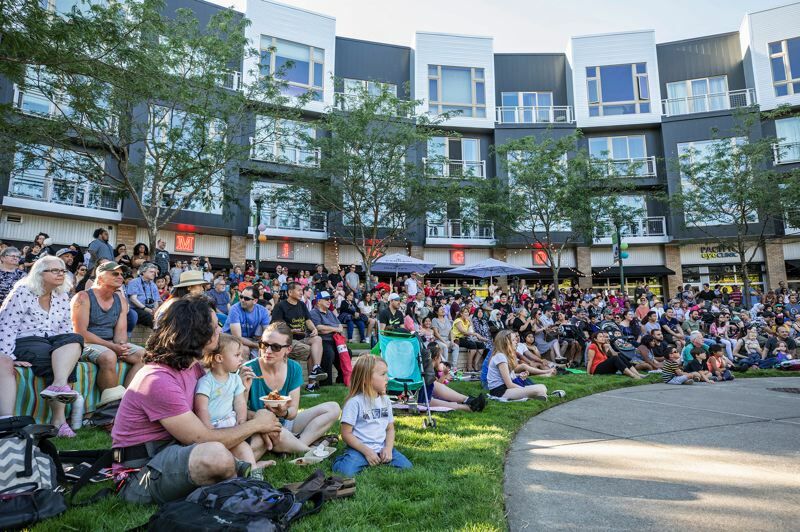 Since the market began in 2015, it strives to remain reminiscent of international markets while attracting around 14,000 people since beginning, read the City of Beaverton website. Beaverton Mayor Denny Doyle attended with his wife and spoke to the crowd before a Russian theater group "Scarlet Sails," took the stage for a number of acts. "I believe in the arts and I'm proud of them," Doyle said. He said the night market is "celebrating cultures from all over," and will continue to be a tradition each year. This years second and final night market will from from 5 to 10 p.m. Saturday, Aug. 11, at The Round, 12725 SW Millikan Way, Beaverton. The night market sponsor for 2017 and 2018 is the city's Diversity Advisory Board. Monica Estrella has been a member of the board the past four years, as well as a volunteer at the market's information booth. "We believe in the goal of diversity," she said. "The market is really growing" with more vendors and the addition of an area for children's activities. Estrella was pleased this year's markets will reflect increased representation of South America for attendees to enjoy. "They are going to discover new places, people and cultures," she said. Kevin Henderson has been on the same board for a year. He volunteered as a stage emcee. 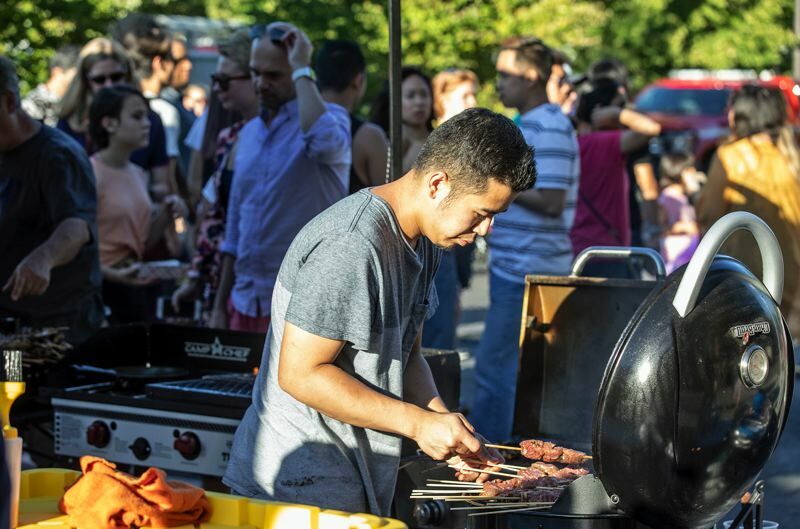 "I volunteered to be on the Beaverton Night Market subcommittee because I wanted to have a more tangible role in creating its vision," he said. 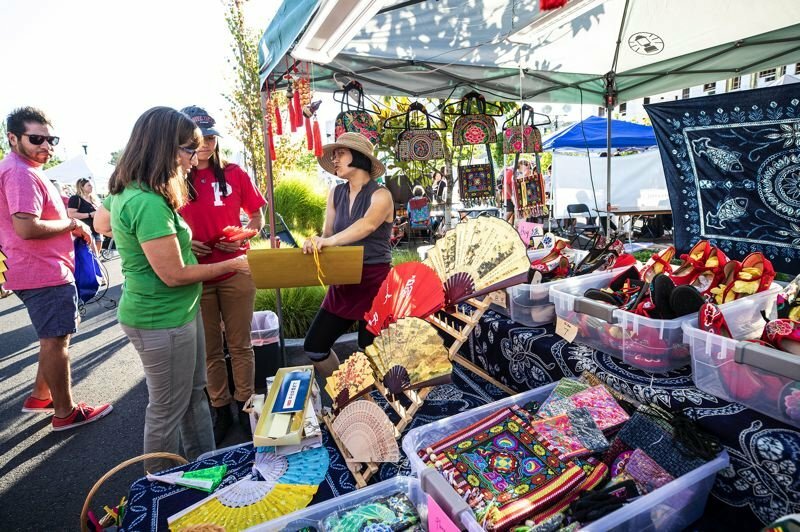 "I think the market is a uniquely powerful event as its focus has always been to remind people of their home countries and showcase the cultures that exist within Beaverton." Among the 50 vendors were two who were first-timers at the Beaverton Night Market. Joe Cuaresma has a pop-up business, Tinidor Foods. Tinidor means "fork" in Tagalog, a native language of the Philippines; and Cuaresma is part of the Filipino Food Movement. "I feel Filipino food is not as represented as other ethnic cuisines" in Beaverton, he said. "Therefore, I would like to introduce Filipino food to others not familiar with it, using high-quality ingredients. I want to expose them to our culture at the same time." Cuaresma has experienced night markets in the Philippines, Japan and Mexico. He also saw his participation also as a business opportunity. There are Filipino restaurants in Beaverton, Tigard and Hillsboro — but they are far short of the number serving Chinese, Japanese, Korean, Thai and Vietnamese cuisines in Washington County. "There is a lot of community and diversity in Beaverton," he said. "I cannot believe this city has provided this opportunity to someone who has never owned a business." For Anabertha Owusu Bempah, owner of Ubuntu African Designs, Saturday also was her first Beaverton Night Market. She did participate June 30 in My People's Market, sponsored by Travel Portland and Prosper Portland, formerly the Portland Development Commission. "Both my grandma and my mom sold African fabrics. Growing up, I would help them at the market during holidays from school," Bempah said. "Having the opportunity to do it one more time after so many years was fulfilling." Ubuntu is Nguni Bantu for "humanity," and also refers to a South African concept of reconciliation. Bempah said her clothing and accessories embody that spirit. "For me African fabrics and beads are my passion," she said. "The vibrant colors, beautiful and diverse patterns tell a beautiful story about our rich and diverse culture. It is an honor to flaunt them."